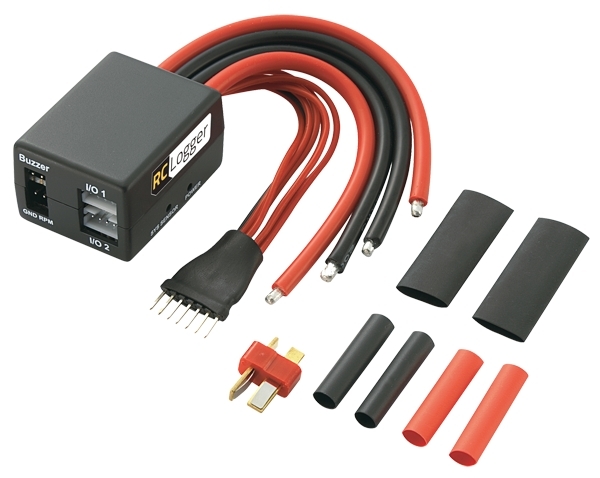 This product is intended for connecting it with the RC Logger HD, RC Logger HD2, RC Logger PRO or RC Logger LC (not included) to provide system data such as power usage including voltage-, current- consumption and motor RPM during flight. This will allow users to determine the total current drawn from the ESC/BEC as well as the voltage provided from the main battery. The module will also allow to check individual LiPo cell voltage, whereby 6S are supported. The collected data can be viewed and analyzed with the RC Logger Viewer PC Software. Exported data may also be analyzed by Microsoft Excel or similar applications. All collected add-on module data are synchronized with the video- or photo- material captured by the RC Logger (HD version only). The included buzzer will alert the user if any of the cells appear to be faulty or low capacity. The buzzer may be connected optionally if required but is included with the product shipping content.